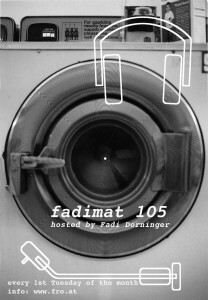 fadimat - monthly radioshow from wolfgang fadi dorninger aka "DORN"
housebuilding, new kids on the block, buying analog & digital gear, and of course a lot of music and at this time. so yesterday we where invited to the famous radioshow from mastermind and houztekkartist „fadiDORNinger“ @ his wonderful radioshow near the river danube, called „the fro studios“ in linz upper austria. Here is our playlist from last night and a soundcloud link to the page from PDP-11 aka Uciel. Maximilian Meindl is still working on his score sounds & building up a live set up for the future, so keep you r eyes open for any further announcement. Playlists, info, etc, … here! fadimat105 radio show (10 CET – Vienna time) – with music from experimental to techno, from Austria to USA, ……… turn your radio on. 105 MHZ im Großraum Linz or via stream – see link. Next Fadimat105 radioshow: 04.06.2013 at 10 pm (CET). tonight fadimat105 radio show (10 CET – Vienna time) – with music from experimental to techno, from Austria to USA, ……… turn your radio on. 105 MHZ im Großraum Linz or via stream – see link.